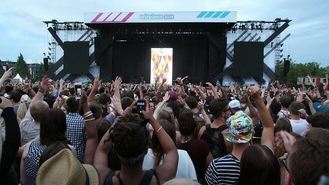 The 37-year-old musician, who topped the bill on the Main Stage on the opening day of the London leg in Finsbury Park, was heckled and festival-goers walked out after he indulged in an expletive-ridden rant during his 90-minute set. "I'm not particularly angry but they've taken the idea of celebrity and tried to make me seem like I'm stupid or something," he said on stage in reference to the media. West, who is no stranger to controversy after his scuffles with the paparazzi and the press, continued: "People keep looking at me like I got a problem or something, like I'm not doing something I'm meant to. The lies, the media, they want to make you feel like you're less to them in their eye." The rapper, who played hits including Stronger, Cold, Diamonds From Sierra Leone, Heartless and Jesus Walks, also took a pop at fashion brands Nike and Louis Vuitton, with whom he has had feuds, and the idea of celebrity during his fiery tirade. He ended his long-running partnership with Nike to sign a deal with rival Adidas amid a row over royalties and creative freedom. "Don't discriminate against me 'cos I'm a black man or a celebrity," he told the audience. "I'm not going to mention Nike or say names but if you're creative, want to create more, this is exactly what I'm talking about. They say, 'No no no n*****, that's too much'. It's about my dreams, it's about creating, not about the idea of being a f****** celebrity. "That wasn't my fault about Nike - they tried to control me. I just want to make something awesome, hang around my awesome friends and save the world. "A lot of people don't realise they own power, they own connection. They say, 'How can Kanye go down his whole career and say so much vile s***?' It's because I got the Clique," he said before launching into his track, Clique. West - who married reality TV star Kim Kardashian in Florence, Italy, in May - later showed his softer side with Runaway/If You Love Someone Tonight, where whispers of Kardashian were heard throughout the song. West's explosive set came after the likes of Pharrell Williams, who ended his hour-long performance with chart-topping hits Get Lucky - his collaboration with Daft Punk - and Happy. West will also step in for Canadian rapper Drake, who dropped out of his headlining slot due to illness. The Take Care singer had been scheduled to take to the stage on Saturday, but West will now play a second night in London. Tinie Tempah, Iggy Azalea and Basement Jaxx also performed at Wireless, which takes place simultaneously in London and Birmingham this weekend. There was also chaos for music fans after Finsbury Park Tube station was closed for planned maintenance works shortly before the gig ended. Bruno Mars, Robin Thicke, Salt-N-Pepa, Ellie Goulding and Naughty Boy are among the other acts playing at this year's three-day festival.